Which Animals Appear Most Frequently on National Geographic Covers? Nearly a quarter of all National Geographic covers has an animal on it. This infographic shows which of them get featured the most. At 30 covers, birds dominate the list. That's almost 20% of all covers featuring an animal. Next up are apes and chimps at 13, and bears at 12. "It's not so much about bird species," points out Kathy Moran, the magazine's senior editor for natural history. "They're usually stand-ins to represent environmental issues." For example, the brown pelican coated in oil on the cover of October 2010, which illustrates a story on the Deepwater Horizon blowout in the Gulf of Mexico. This is actually a really exclusive list. 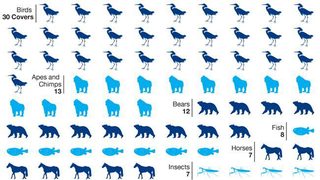 Lots of animals missing, like cats (! ), rhinos, and giraffes. Oh, and dinosaurs (which must've been a deliberate omission because NatGeo has had some really cool covers with dinos on them).